Will You Have Enough Money In Your 401K To Retire? 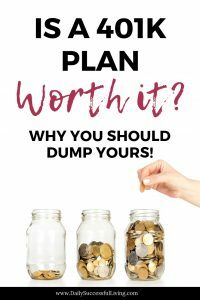 Is It Time To Dump Yours? 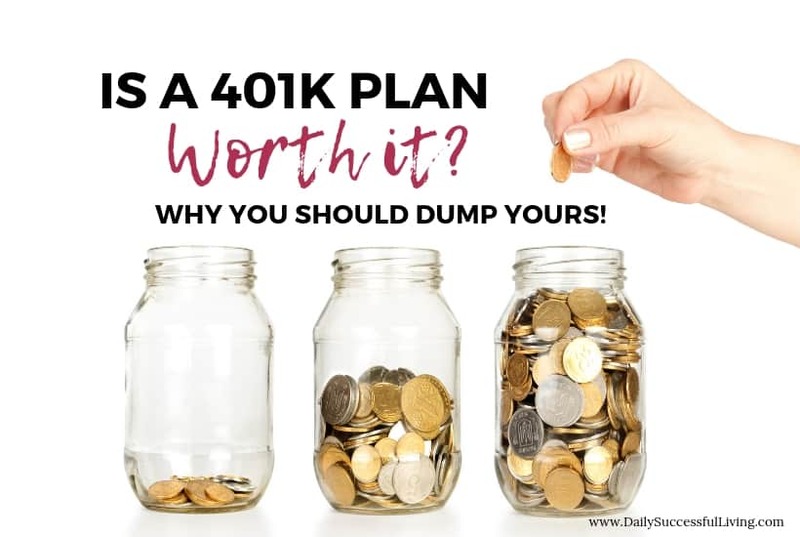 After a lot of research, I’ve decided that in many cases 401k plans aren’t worth it. As a result, I just made some radical changes to my retirement plan. I’m cashing out $120,000 in my Roth IRA (and getting a 10% tax penalty in the process) over the next three years to invest into The Maximum Premium Indexing Program. Is A 401K Worth It Anymore? I’ve been investing into my 401k/IRA since I was 24 years old. It has been slow and steady investing. I’ve had to stop investing a few times over the years, but for the most part have been continually contributing to my plan. I did drastically reduce my contributions during the 5 years we were paying off our consumer debt. Between my husband and I we currently have just under $200,000 in retirement accounts. In theory if we have an 8% average return and continue our current contribution levels and want to retire when I’m 60 (Aaron would be 62) we would have just over $1,000,000. That sounds like a ton of money doesn’t it? It is, but here is the problem. As you begin to age, typical retirement planning recommends that you move your money from higher risk investments to more stable stocks with a lower risk level. Then as you continue to age you gradually shift your portfolio to a larger bond vs stock mix. This means that as you age, your investment growth returns will typically decrease. The standard rule of thumb is that when you are younger, you have a larger mix of stocks in your investment portfolio since you have time to absorb risk. As you get older, you gradually add more bonds to the mix which means a lower rate of return, but more stability. No one wants to have crazy risk in the 5-10 years prior to retirement. You are trading the potential for higher returns for lower risk. By the time you reach retirement typically most of your money is in low-risk products with a corresponding lower rate of return. The theory is great and I understand why it happens, but when you actually sit down and look at the number, things suddenly aren’t so rosy. That million dollars I’ll have saved up by 60 means I’ll be generating $40,000 in income annually. You read that right! Even though I should have a million dollars when I retire I’ll only get $40,000 worth of income. That is only $3,333 per month (which you may still owe taxes on). What is the Retirement 4% Rule? Years ago a bunch of really smart people got together and took a look at retirement funds. What they realized was that in order to preserve your nest egg (your account balance) so that it would last you all the way through retirement, you could only draw a certain percentage of the funds. If you draw too much from your nest egg too quickly then you won’t make enough interest on the remaining balance to be able to keep paying yourself each year. You guessed it – this is how the Retirement 4% Rule was born. If you look at your 401K monthly retirement statements they always give you an estimated retirement income. I bet you looked at that income number and thought you’d be fine even though you may have similar projections as mine. What you may not realize is that your projected income numbers almost always include social security. I don’t know about you, but I don’t anticipate getting much out of social security in 20 years when I’m really to retire. I’m certainly not going to hinge my retirement planning on the potential for actually getting money from the government. I don’t mind doing a little bit of downsizing in retirement, but downsizing to $40,000 really isn’t something I want to do. So after making a careful assessment of my retirement situation I realized I was in trouble. My 401K plan wasn’t worth it anymore! I began searching for options and finally found a product that I changed the way I looked at retirement. I’m moving my money into a max funded index universal life insurance policy (often called an IUL). I’m a huge Dave Ramsey fan (he got us out of debt) and as a result had purchased a term insurance policy and then completely ignored life insurance as a retirement tool. Big mistake! Max Funded Universal Life Insurance policies are an amazing way to put money away without the associated risk of actually putting your money into the stock market. I’m not going to go into crazy detail for this post, since it is already super long, but here are some of highlights of IUL insurance. 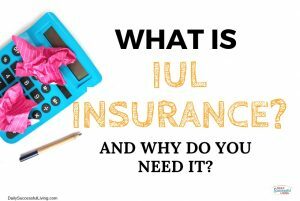 Check out this post for more information on the pros and cons of IUL Insurance. Death Benefit & Cash Value Provisions – IUL policies include a permanent life insurance portion, so you have both life insurance (death benefit) and cash value. Keep in mind that the death benefit on an insurance policy isn’t taxed, so you are able to pass on this money free and clear to your heirs. Minimal Fees – When set up correctly, the fees associated with these accounts are minimal and the vast majority of your money is going towards the cash value rather than the insurance company. It is important to note that in the beginning your fees are higher, but they decrease substantially by year 5 and aren’t tied to a percentage of your nest egg which means they don’t increase with the growth of your money. Make sure that you are investing in a Max Funded IUL Policy not a level policy or you don’t see the cash value growth and have higher fees. This means that you get the benefit of the stock market without the inherent risk – see why below. 0% floor – This is the absolute best part of an IUL. Your annual earning will never go below zero. So if the stock market has an absolutely horrible year, you just won’t make any money. On the other end, you also have a max cap (usually 12-13%). This means that you won’t get the full upside of the market either and your gains are always capped out. I’m very willing to live with the cap in return for the guarantee of never going below zero. IUL Loan Provisions – Index Universal Life Insurance Policies have a crazy little loan provision that is absolutely amazing. When you pull money out of an IUL using the loan feature, all it does is decrease the value of your death benefit. Since it is a loan the money isn’t taxed and the amount of interest you are paying is very minimal and is credited against the interest you are earning on the rest of your policy. It is a bit more complicated than this, but in general terms the loan policy provision can be very beneficial. Higher Returns – When used as a retirement vehicle, you don’t need to switch from stocks to a bond-heavy portfolio when you are closer to retirement because of the zero floor and also because your money isn’t actually in the stock market. K – I want to be very clear here, although the risk is significantly decreased using a max funded universal life policy, there is no guarantee. Just like your 401k plan, your ultimate returns aren’t guaranteed. Here is what I do like though, your risk is significantly decreased with an IUL policy. The zero floor and the indexing means you don’t have to worry about the negative stock market years. Also since your money isn’t actually in the stock market and is guaranteed by a life insurance company the changes of losing your money decrease significantly. When I first heard about the max funded indexed universal life insurance policy I didn’t believe it would work. I watched youtube videos, read everything I could and talked to financial planners. When structured properly a max funded IUL insurance policy is an amazing product. BTW – when you start doing your research make sure you are looking at max funded IUL’s. The level funded products most financial articles discuss are junk. I’m not anti-401k plans at all. My husband’s company has an amazing plan and he is going to continue to contribute. 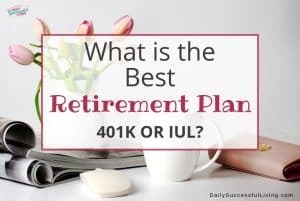 What I do have issues with is people blindly putting their money into their 401k or IRA without knowing and understanding the limitation of these plans. How much are your annual/quarterly broker fees? How much are the fees on the individual stocks, bonds, mutual funds or ETF’s. What is your growth projections? Most statements have a graph that shows your anticipated growth and projected retirement income. You’ve got to dig into these projections. Typically, they are based on fairly high returns and include your social security income. You’ll also want to see what numbers they are using to estimate how much you can take out each month. If they are using more than 4% then changes are you’ll eat into your nest egg and you may run out of money before you die. Keep in mind that death rates have increased significantly and it isn’t unusual to live into your 80’s or 90’s. Hopefully you aren’t shocked with some of the numbers you find once you start digging. If you have problems locating the information drop me an email and I’ll see what I can do to help you dig through the statements. Once you’ve dug through your statement and looked at the numbers you need to do some projections. Personally, I would take social security income completely out of the equation. If you get money from social security that is just icing on the cake. I don’t want to plan on living on social security. Social security was never intended to fund anyone’s retirement. It was started as a supplemental program and unfortunately many people are unaware of how small the payment actually are. On a side note you have to read this article about how social security income is taxed. I bet you didn’t realize that if you earn too much money in retirement, then the government will take take some of it back in the form of a benefit tax. Individuals with a combined income over $34,000 and couples with a combined income over $44,000 could be taxed on up to 85% of their benefits. Crazy huh! I didn’t realize that the government taxed social security income. Seems pretty unfair since you’ve already been taxed on the money. How Much Money Will You Have When Your Retire? Being able to estimate how much you will have when you retire is super important. Take a few minutes and do some calculations for yourself. I used this retirement plan calculator. With those basic numbers I should have around $1,228,000 when I’m ready to retire. This means that I should have just under $50,000 of income each year. How much money will you actually have at retirement if you continue to contribute the same amount annually (hopefully with a 2-3% increase each year) and get a good solid rate of return of around 8%? I know that some people can get higher returns, but I’d rather lowball my returns and then be pleasantly surprised when I do better. Then once you have a general amount of money you expect to have, you need to calculate how much of that money you can actually draw each year to live on. As I mentioned above the standard rate for withdrawal is 4%. If you have 1,000,000 dollars in your retirement accounts then you can safely take out $40,000 each year. If you are completely debt free and already living a pretty frugal life, then $40,000 is pretty doable. However, I would really prefer not to take a pay cut during my retirement. I have worked dang hard over the last twenty years and plan to work hard for the next 10-20 before retirement and to be completely blunt, I don’t want to be living on $40,000 a year. I really don’t want to be living on $40,000 twenty years from now – hello inflation – I can’t even imagine how much gas and other necessities are going to be. Keep in mind too, that you are pretty much set at $40,000 each year, you won’t be getting annual performance bonuses at work. At the same time, inflation is going to be steadily decreasing. You may also have a tax issue as well. If your retirement accounts are funded with pretax dollars (Traditional 401k/Traditional IRA) then you will also be paying taxes on your $40,000. On the low end that means you will have a tax hit of around $8,000. Suddenly that means you are trying to live on $32,000. Hopefully, you will have more than 1 million saved by the time retirement comes and this won’t be as much of an issue. My husband and I were projected to have just over $1.2 a million in savings. We knew that we would most likely be debt free, but when I really started digging into the numbers I was so frustrated. I’ve spent years slowly building up my portfolio and knew that I would be putting more and more money into it over the next couple of years just to live on $40,000-60,000 dollars. I have no problem living on $40,000, but that isn’t what I want – I can be super cheap when needed. However, I want to be able to really live during my retirement years. I want to be able to visit my kids, go on fun vacations and be the dotting grandma that gives tons of fun amazing gifts. I can’t do that on $40,000. Because of the structure of the Max Funded Indexed Universal Life Policy, the 4% provision isn’t a factor. Since you have the 0% floor and you aren’t forced to begin shifting your lucrative high returns stocks to stable bonds as you get closer to retirement to protect your nest egg, you can easily take 8% out of your policy each year. This means that the same $1,000,000 suddenly gives you an annual income of $80,000 each year. That extra little bit of security means a shift in income from $40,000 to $80,000. Isn’t it crazy what a simple 0% floor can mean for your money? To really see the value of the 0% floor you’ve got to check out the post I did on IUL insurance and why you need it, about half way through the article I’ve included some spreadsheet that explain how amazing the 0% floor is. The 0% floor and the asset protection it gives you will blow your mind. I know that switching from an IRA/401K is a major shift in the way that you think and I totally get it. When I started looking at the numbers, it completely blew my mind. As I mentioned above, I went and got my insurance license in part to prove my friend wrong. It is crazy to me that such an amazing product is readily available to the general public and very few people know about it. To be blunt, one of the reasons people don’t know about it is because it is one of the lowest commission products for insurance brokers. When you set up a max funded IUL, you are minimizing the death benefit portion of the insurance. The death portion of the insurance is where agents make their commission. I know it is really hard to explain in detail how this works on paper and if you are anything like me you want someone to explain it to you in more depth. If so, feel free to drop me an email or give me a call at 475-619-2740. If you have any questions about this product, feel free to reach out to me, I’m the dork that loves talking about this type of stuff! Great article for information junkies like me! We are doing the MPI system, too. Nice! I hope it makes you (and me) tons of money! Interesting plan, I’ll have to investigate! Thanks for the tip! It is actually a google number, not my cell phone number, so I’m hoping it won’t be crazy annoying with the bots!